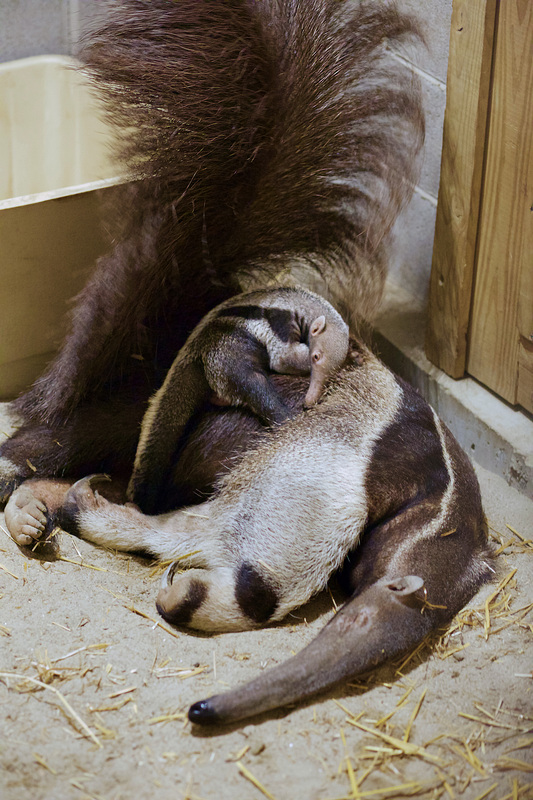 For the first time in zoo history, a Giant anteater has been born at Connecticut’s Beardsley Zoo. Arriving on February 13 and weighing 2.4 pounds (1100 grams) at birth, the baby is now just over 14 inches and was born after a 175-day gestation period. Proud parents are first time dad “EO” and second time mom, “Pana.” The pair was brought to Connecticut’s only zoo with the hopes of successful breeding. Currently mother and baby are off exhibit with plans for a debut in late spring 2016. 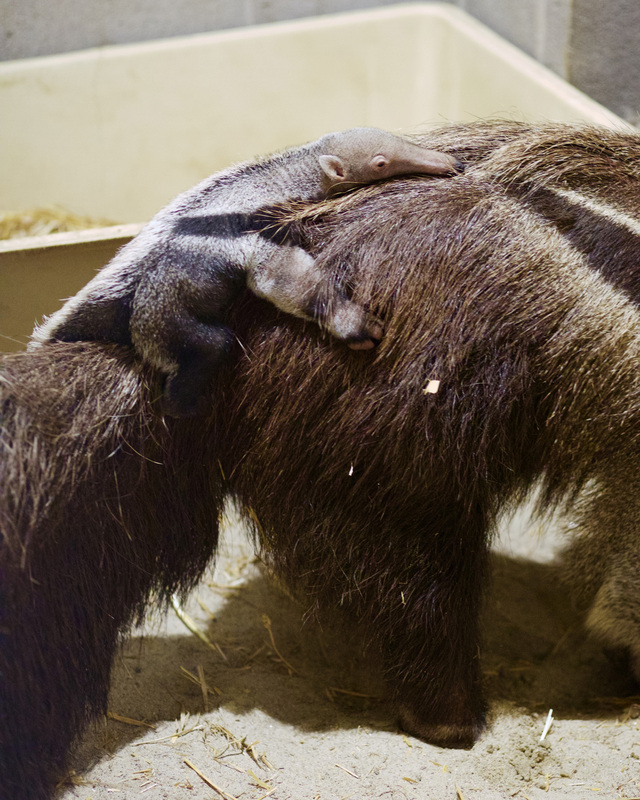 Female anteaters give birth to one offspring and the baby rides on mom’s back for the first several months of life, occasional venturing off not too far from mom to explore its surroundings. For the first week, mom will spend most of her time sleeping while bonding occurs and the baby gains strength and weight. The gender is unknown at the current time due to the difficulty in determining at such a young age. When mom and baby go on exhibit, dad will not be allowed to be in the same exhibit due to mom’s protectiveness and the potential of dad hurting the baby. Dad will be on exhibit elsewhere on zoo grounds. The baby will be on exhibit thru the summer season and into the fall. The Giant anteater parents came to Beardsley from Palm Beach Zoo in Palm Beach, Florida. Both Pana and EO, are six years old. They arrived in late May 2015 and are a highlight of the Pampas Plains exhibit, which opened in August 2015. Featuring animals from the Pampas region of Argentina, Uruguay, and Brazil, the new exhibit represents phase one of the zoo’s South American Adventure exhibit. It is part of the zoo’s Master Plan to exhibit and care for South American species and was funded in part by private donations as well as funding from the Connecticut Zoological Society with support from the City of Bridgeport. Anteaters can live up to 26 years old in captivity and are usually solitary animals. They can weigh up to 100 pounds, and are five to seven feet long. Their home range is from southern Belize to northern Argentina and they live in grasslands, humid forests, and woodland areas. Anteaters have one of the lowest body temperatures in the animal kingdom at 91 to 97 degrees Fahrenheit and can eat up to 30,000 ants per meal in the wild. The Latin name for anteater is Vermillingua, meaning “worm tongue,” which can be as long as two feet.